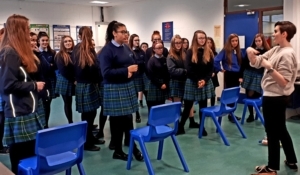 Mr Alan Devine, from Dramaclub, provided a fun workshop for Transition Years in which all students got the opportunity to work on the important life skill of public speaking. Mr Devine, a familiar face from TV and film, worked with the girls throughout the day in developing their confidence when speaking to and engaging with an audience. He highlighted that it is a skill that everyone can improve upon through confidence, preparation and technique. Games and role-playing exercises were used to dispel nerves and to get the girls on their feet and talking. All students got the opportunity to put their learning into action by creating and delivering a short speech. We look forward to seeing the fruits of their labour in the classroom throughout Transition Year, on into Senior Cycle and beyond. 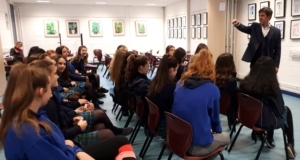 Mr Roger Mehta, an advocate for educating and raising awareness about mental health and substance misuse, visited the school to work with our Transition Year students. During the workshop the girls were engaged with the issue through the universal language of music. As music plays a pivotal role in the development and identity of many teenagers, it makes learning about such a life threatening subject very accessible. The girls learned about the connection between mental health and substance misuse, the impact of these substances and the developing teenage brain and the underlying causes that lead to the misuse of alcohol and drugs. Mr Mehta taught techniques to combat peer pressure in the area of drug and alcohol misuse. Students also considered the actions they can take in their own lives to promote positive wellbeing. The workshop also involved the girls writing and performing their own raps, poetry or songs, expressing their own feelings on the topic. It was an extremely worthwhile experience for all. Ms Eimear Manning, from ECO-UNESCO, delivered an eye-opening workshop on the need for the protection and conservation of our environment. ECO-UNESCO aims to raise environmental awareness, understanding and knowledge among young people. The hands-on workshop was based on two simple ideas: “learning by doing” and “thinking globally, acting locally”. It got the students exploring the idea of Sustainable Development in a global context and encouraged them to think about their own values and patterns of consumption. Throughout the day the girls focused on a variety of issues including fast fashion, food waste, climate action, getting drastic about plastic and what the Earth sustain. 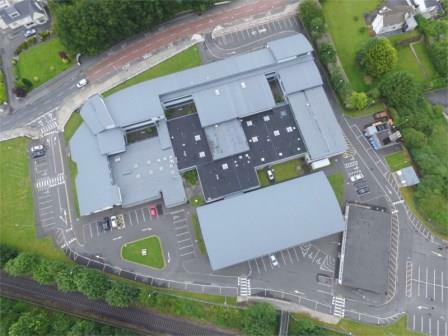 Our Lady’s Bower has a very active Green Schools’ Committee and workshops such as this enable our students to become active agents of change within the school and wider community.